I imagine my story isn’t that different from the other 800,000 DREAMers. When we first came, we felt isolated – we didn’t know anyone, our family was back in Mexico, and we didn’t speak English. My parents, fearful of deportation, told me and my sister not to talk to anyone about our immigration status – casting me further into the shadows. But, as my memories of Mexico started to fade, America became my home. I used to have vivid memories of my life, my home, and my friends in Mexico, but they’ve been replaced by my memories here. This is where my friends and family are, and this is where my future is. Aside from my parents’ anxieties, my childhood was peaceful. My parents were lucky enough to find jobs and provide for us. They sheltered me and my sisters. I didn’t realize until I was older how well-founded their fears were. At the time, Sheriff Arpaio was terrorizing our community and the Arizona legislature was passing a plethora of racist laws. Since we came to the States, I knew that I was “sin papeles,” but I didn’t know the weight of being undocumented. In high school, we started doing college prep work, and my friends started talking about where they wanted to go. They took college tours out of state and came back with stories of brick buildings with ivy and libraries with aged leather chairs to study in. My lack of a Social Security number, coupled with my parents’ fear of me traveling, left me feeling barred from the future that I dreamed about. It was a rude awakening. That wake-up call drove me into immigrant rights and social justice work. It makes my parents nervous – they’re worried the police will arrest me for protesting and speaking out about how this system has failed so many of us. I realize the risk, especially now, but this is my home and I want to fight to stay here. 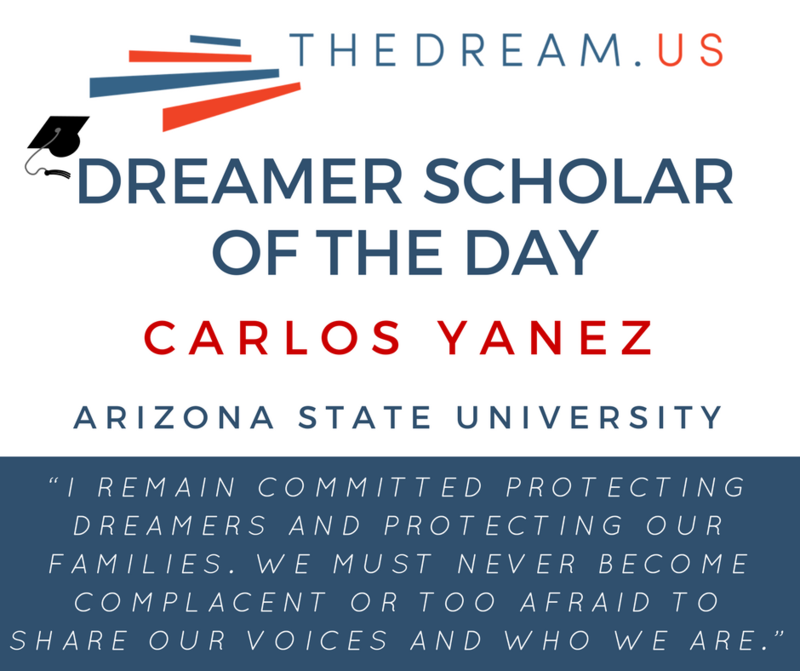 My activism started with an internship with the No Dream Deferred at the Center for Neighborhood Leadership, which focused on helping the community fill out DACA and TPS paperwork. I volunteered extensively with Mi Familia Vota, which is where I learned the ins and outs of citizenship and residency paperwork. Now, I pass that knowledge on during community forums to help neighbors fill out forms for free. I also founded IDALI (Inmigrantes con derecho a la igualdad), which provides information and mentoring to undocumented underclassman, so they have the resources to be able to go to college and succeed. Jorge Ramos submitted a video to our organization to encourage high schoolers to keep working on their papers, and we hosted a community forum at the local High School with booths from the Mexican consulate, Trans Queer Pueblo, Be a Leader, and Scholarships A-Z. When I graduate, I hope to become a doctor and provide healthcare to undocumented immigrants. I know the difficulties of growing up without being able to see a doctor – it was too expensive and my undocumented family members don’t qualify for government-assisted healthcare. I want to provide for my parents and for others, like my parents provided for me. Without education, I can’t accomplish that goal. The next stop in my journey is at Arizona State University, where I’m now studying. I remain committed protecting DREAMers and protecting our families. We must never become complacent or too afraid to share our voices and who we are.